Danton Heinen is a Canadian professional Ice-hockey player who plays in the National Hockey League (NHL). As of 2019, Heinen currently plays for the Boston Bruins as their Right wing. As a Right-wing, Danton reportedly earns around $995,833 as his yearly salary from Boston Bruins. Further, Danton Heinen has an estimated net worth of over $1 million. Danton Heinen was born on July 5, 1995, in Langley, British Columbia. Apart from the pictures, there aren't details about his father and mother in the media yet. As per his nationality, he is Canadian and belongs to the White ethnic group. Further, his star sign is Cancer. I know she doesn’t look it, but she’s 50! Happy Birthday Vern! Heinen played junior hockey for the Merritt Centennials and Surrey Eagles in the British Columbia Hockey League (BCHL) before playing American college hockey for the Denver Pioneers University from 2014 to 2016. As of 2019, Danton has an estimated net worth of over $1 million which is quite similar to Matthew Peca. He reportedly signed a 3 year/ $2,987,500 contract with Boston Bruins, including a $277,500 signing bonus, $2,987,500 guaranteed in 2016. Further, the NHL player has an average salary of $995,833 annually while Tuukka Rask is among the highest earners of the team with an annual salary of $7,000,000. Danton Heinen so far has made earnings of $1,692,500 from his entire NHL career. Additionally, in the 2018-2019 season, he will earn $832,500 as a base salary and $92,500 as a signing bonus. Talking about his relationship status, he is not married. Further, the famous right wing has kept his personal life low profiled. Unlike his professional career, it is a tough task to dig up about his personal life and more importantly about his relationship status. He hasn't revealed a single hint about his girlfriend and affair in the media yet. Further, he seems to be focused on establishing himself as one of the prominent right wings, similar to Jaromir Jagr and believes being in a relationship can halt the process. Talking about body measurement, the Famous NHL star is 6 ft 1 in (185 cm) in height and weighs around 85 kg. In the 2014 NHL Entry Draft, he was selected by the Bruins, 116th overall. 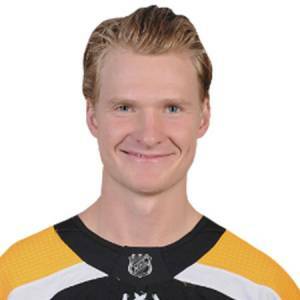 Heinen impressed and was surprisingly kept on the opening night roster for the 2016-17 season following his first training camp with the Bruins. He made his NHL debut in a victory over the Columbus Blue Jackets on October 13, 2016. On October 17, 2017, Heinen was assigned to the AHL after playing three games during the 2017 - 18 season. Later, he was recalled on October 26, 2017, where he scored his first two NHL goals in a 2-1 win over the San Jose Sharks. Currently, he is playing along with his star team-mates such as Patrice Bergeron, David Krejci and many more.